Innovation made significant progress in 2016. We saw an Amazon drone make its first commercial delivery in the U.K. and a fleet of self-driving Ubers hit the roads in Pittsburgh and San Francisco. But the year wasn't so good for all tech products. Let's recall the rise and fall of hoverboards and the ongoing saga of exploding Samsung Galaxy Note 7 smartphones. Other products went more quietly into the night: The last ever VCR was manufactured in July. 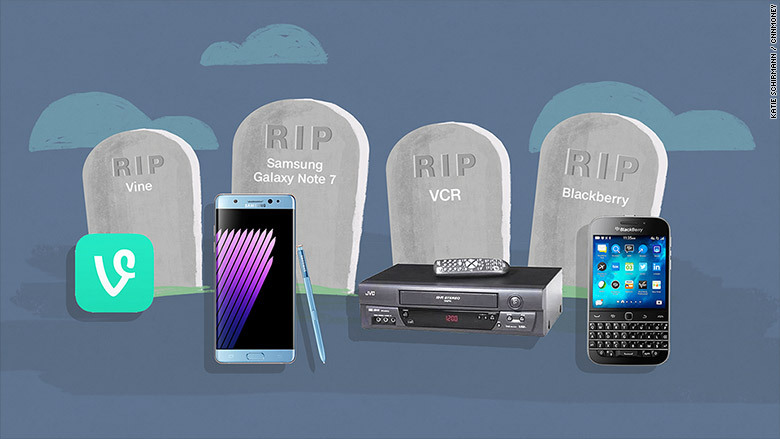 Here's a closer look at the tech products that kicked the bucket in 2016. Apple (AAPL) killed off the jack in September in favor of wireless headphones. The move, which upset some of its loyal users, forced new iPhone 7 users to either use a dongle or invest in wireless headsets. Related: Apple AirPods review: Do they actually stay in your ears? The concept of wireless headsets might take time for a mass audience to accept, but it's a part of Apple's big effort to propel the audio market forward. In a few years, we'll likely look back on how weird it was that we once wore wires dangling from our ears.